We all know the Jeep Grand Cherokee Trackhawk is stupidly quick. Thanks to the wonders of all-wheel drive traction off the line, the 697bhp beast can beat an impressive array of cars to 60mph, including the pre-update Dodge Challenger Hellcat with which it shares an engine. 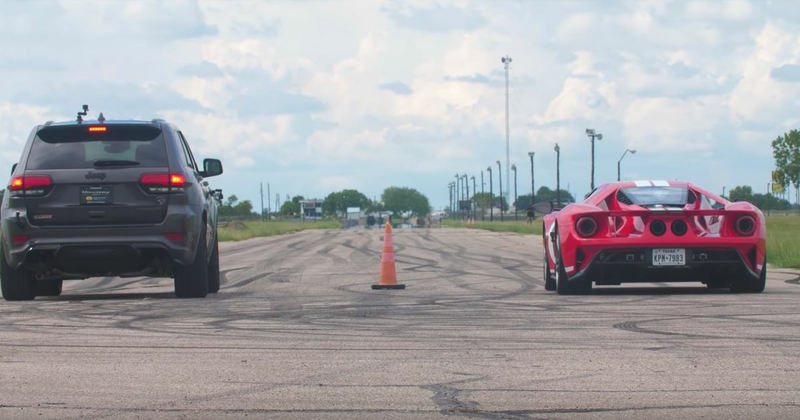 But the Trackhawk surely doesn’t have a hope against Ford’s GT supercar - which completes the benchmark sprint half a second quicker - in a straight-line battle, does it? If we’re talking about a normal Trackhawk, hell no. But this is no ordinary example - it’s been overhauled by Hennessey. The Texan tuner’s HPE1000 kit boosts the output to a maddening 1012bhp at the crank, by switching out the standard supercharger for a 4.5-litre one and adding all manner of supporting mods. 0-60 drops to 2.8 seconds, a couple of tenths brisker than the GT. Suddenly, this quarter-mile battle is looking a lot closer. We don’t want to spoil the ending, so press play to find out which of the two comes out on top.